Tallinn Airport or Lennart Meri Tallinn Airport is the largest airport in Estonia and serves as a hub for the national airline Nordica, as well as the secondary hub for AirBaltic and LOT Polish Airlines. It was also the home base of the now defunct national airline Estonian Air. Tallinn Airport is open to both domestic and international flights. 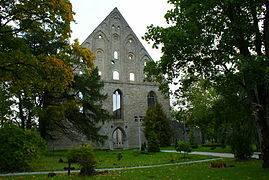 It is located 2.7 nautical miles southeast of the centre of Tallinn on the eastern shore of Lake Ülemiste. It was formerly known as Ülemiste Airport. 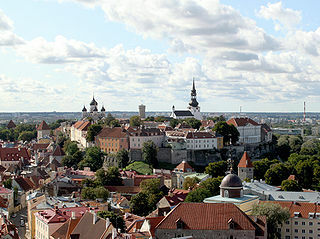 Toompea is a limestone hill in the central part of the city of Tallinn, the capital of Estonia. The hill is an oblong tableland, which measures about 400 by 250 metres, has an area of 7 hectares and is about 20–30 metres higher than the surrounding areas. In folklore the hill is known as the tumulus mound over the grave of Kalev, erected in his memory by his grieving wife. Aegna is an Estonian island in the Bay of Tallinn in the Baltic Sea. Administratively it is part of the city of Tallinn, the capital of Estonia and is a sub district of the Kesklinn district. Kumu is an art museum in Tallinn, Estonia. The museum is one of the largest museums in Estonia and one of the largest art museums in Northern Europe. It is one of the five branches of the Art Museum of Estonia, housing its main offices. Linnahall is a multi-purpose venue in Tallinn, Estonia. It is situated in the harbour, just beyond the walls of the Old Town, and was completed in 1980. 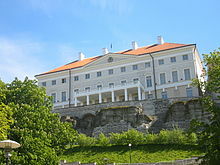 It is not to be confused with the primary administrative building of the historical municipal government (Raad) of Tallinn, often referred to as the Town Hall. The venue also features a heliport and a small sea port. Lasnamäe is the most populous administrative district of Tallinn, the capital of Estonia. Colloquially known as a "Russian ghetto", the district's population is about 119,000, the majority of which is Russian-speaking. Local housing is mostly represented by 5–16 stories high panel blocks of flats, built in the 1970–1990s. Lasnamäe is usually referred to as a bedroom community. 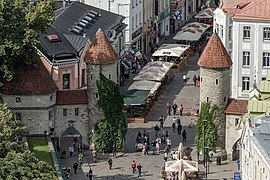 Kesklinn is one of the 8 administrative districts of Tallinn, the capital of Estonia. It is situated on the Tallinn Bay and bordered to the northwest by the district of Põhja-Tallinn, to the west by Kristiine, to the southwest by Nõmme, to the east by Lasnamäe and Pirita, and to the south by Rae Parish, beyond Lake Ülemiste. The island of Aegna, located in the Tallinn Bay, also falls within this administrative district. Kesklinn has an area of 30.6 km2 (11.8 sq mi) and a population of 57,731 ; population density is 1,886.6/km2 (4,886/sq mi). 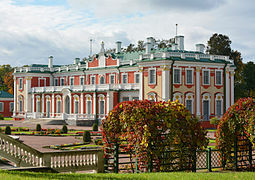 Kadriorg is a subdistrict in the district of Kesklinn (Midtown), Tallinn, the capital of Estonia. It has a population of 4,561. The subdistrict name derives from the Catherinethal, a Baroque palace of Catherine I of Russia. It is one of the wealthiest regions in Estonia. 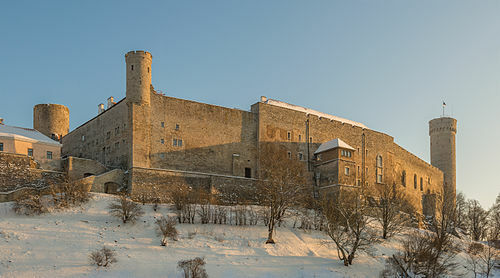 The Estonian Knighthood House is a building in Toompea, the upper part of Vanalinn, the historic inner town of Tallinn, the capital of Estonia. Its address is Kiriku plats 1. The Dome Church is situated at the same square. Tallinna Kalev/TLÜ is a professional basketball club based in Tallinn, Estonia. The team plays in the Korvpalli Meistriliiga (KML). Their home arena is the Kalev Sports Hall. 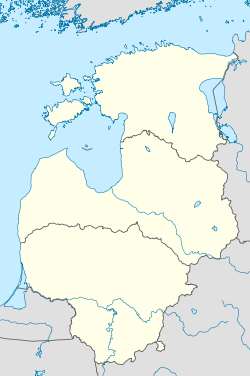 The Tallinn Bay is a bay in Estonia on the southern coast of the Gulf of Finland. 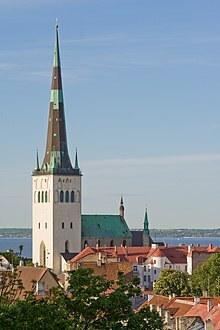 The Estonian capital city Tallinn is located on the southern coast of the bay.